09-04 | Fundamentals of Image Characteristics: The MR Image • Magnetic resonance imaging | NMR MR MRI | Essentials, introduction, basic principles, facts, history | The primer of EMRF/TRTF. A decisive criterion for comparing the contrast of different images and different MR machines is the contrast-to-noise ratio. Figure 09-10 explains the contrast-to-noise relationship. Without noise, two neighboring tis­sues with different signal in­ten­si­ties can be easily distinguished from each other. If the level of noise is low (Figure 09-10 center), contrast-to-noise is sufficient and the tissues are distinguishable. 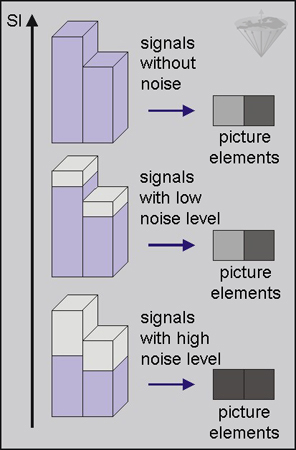 In case the noise level is high and signal-to-noise is poor, it is difficult or impossible to distinguish the tissues from each other (Figure 09-10 bottom). Even if there is sufficient contrast bet­ween two tissues, noise may ob­li­te­rate this contrast and no dis­cri­mi­na­tion will be possible. Contrast-to-noise. 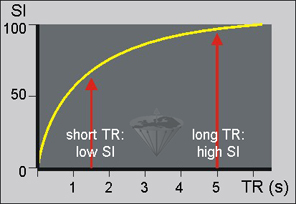 SI = signal intensity. With the increase of field strength, T1 relaxation times increase too. This also has a negative impact on signal-to-noise, because the repetition time TR has to be increased to obtain the same signal-to-noise ratio. Only when sufficient time is granted for the spin system to recover after the initial excitation pulse will signal intensity be sufficient. If we administer the next pulse after a shorter time than 5×T1, our sample will be saturated and its signal intensity will be lower (Figure 09-11). Thus, TR must be sufficiently long to receive a strong signal. However, in general the increase in signal deriving from the higher field strength compensates the T1-related signal loss. The longer the repetition time TR, and thus the more recovered the system will be, the stronger the signal intensity. It is worth noting, that for any given spatial resolution and contrast the signal-to-noise ratio needs only reach a level for confident detection of a lesion. Above that level, further increases in signal-to-noise make the image more pleasant but, on the other hand, 'beautiful' images do not guarantee the accuracy of the di­ag­no­sis. When trying to optimize imaging conditions, one must never forget that there are numerous interdependencies between the different factors influencing the image and image contrast. If we choose imaging speed as the main factor, there is a straight connection to the signal-to-noise ratio and spatial resolution. Spatial resolution is linked to con­trast and artifact reduction. Contrast is also related to signal-to-noise and ar­ti­facts. As we will discuss in the following chapter, altering one minor parameter can affect a chain of other parameters. Chapter 9: Fundamentals of Image Characteristics: The MR Image - Page 4  Go to Chapter 9, page 1, 2, 3, 4, 5, 6.